According to tradition, the former court guest house a few houses had in the Kirchgasse since ancient times south of its current location his shield justice, ie the right to operate a guest house. Documented it appeared in the early 18th century in the period of widowhood Augusta Mary. From 1717 several tenants are recorded in the chronicles, but could not hold it, and the old "swans" as they called it in the vernacular, had to be demolished in 1749. 1762 Shield justice was transferred to the present location. After the traffic from Durlach was moved from the Staig- in the August Castle Road, the operation increased significantly. Thus, the then landlord, Reichard Jordan, built on the simple half-timbered building a large corner building with a magnificent taproom and a dance hall and an apartment upstairs. The old inn continued to serve as the next room. Not least due to the favorable location near the train station was the "Schwan" for the first meeting place of artists, should later settle in the August Castle. Already during their studies the students of 1880 appointed to the Academy of Fine Arts Karlsruhe landscape painter Gustav Schönleber came here. Among them included, among others Kallmorgen Friedrich and Gustav Kampmann. By 1900, the host Jordan acquired a portion of the adjacent castle meadow and had built there a beer garden and a hall as a meeting place for numerous clubs in the village. 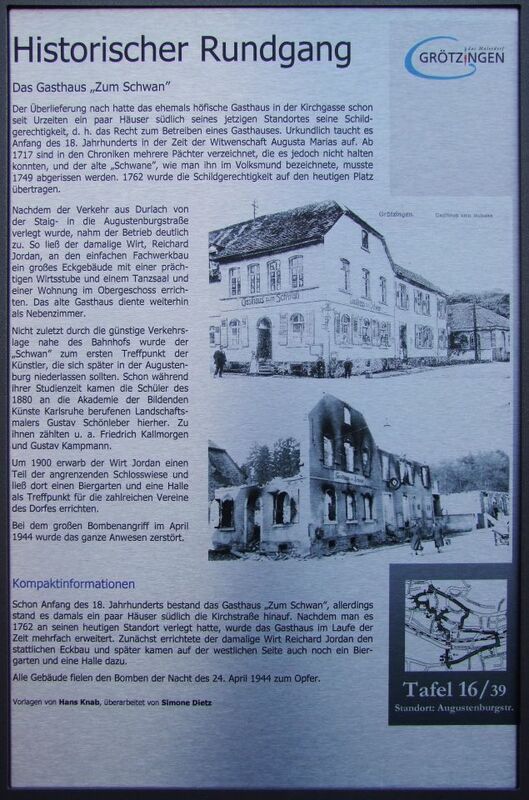 In the great bombing raid in April 1944, the whole property was destroyed.